Living lean is job No. 1 for fledgling entrepreneurs. 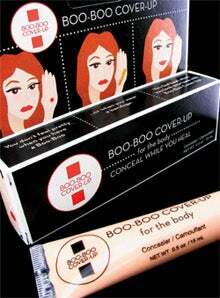 But Brandy Jans, founder and CEO of Boo-Boo Cover-Up, a concealer that helps heal scratches, bug bites and other skin imperfections, took the concept to an extreme. The 30-year-old left a job in the beauty industry in March 2011 to focus on her startup. A few months later, to save cash, she rented out the New York apartment she owns and moved in with her parents in a Detroit suburb. With the money she saved by radically slashing her expenses, Jans was able to hire a photographer, revamp her website and create a TV commercial, all at a fraction of what she would have spent in the Big Apple. Now her product is available through 20 retailers, and she hopes to return to Manhattan by the spring. We chatted with Jans about her startup strategy. What prompted you to move? New York is obviously extremely expensive. You can cut back on a lot of frivolous lifestyle choices, but you can't cut back on a lot of the fixed costs: basic utilities, food and, in my case, a mortgage. I've saved at least $2,000 a month by leaving the city. That's a sizable amount of money that I used to experiment with doing more marketing or more creative things to push the business forward. Did you have any money saved when you left your job? The money I had when I said, "I'm starting my business today," was about $75,000. I still have some of that left. What has decreasing your cost of living meant for your business? I've used the money I've saved to do some pretty exciting things. In October, I aired my first TV commercial in San Francisco. I never thought I would do a commercial until I came back to the Detroit area. There are actually a lot of production companies here, and they're more affordable. I also did a bunch of photography that I was able to use in the commercial, on my website, in print and for in-store displays. I could have done everything that I did here in New York, but it probably would have cost at least three times more. I kind of consider this my incubation period. I created all this marketing collateral, and now I'm ready to release to the world and go full speed. What was the budget for your TV commercial? Under $10,000. That includes the cost of airing as well as production. What's been the biggest business drawback of moving? Staying in touch with industry contacts is a little more challenging. In New York, I was not only in the beauty capital, but also the publication and [media] capital. I could drop something off at a publisher's office if I wanted. I could invite an editor out for lunch. You can't replicate that kind of experience of meeting someone face to face. But you use the internet and your network to find out who knows who. You have to do a little bit more digging, talking to more people and using LinkedIn. You have to be willing to send samples and make phone calls. And if it takes getting on a plane to take a meeting, that's what you have to do. What milestone do you need to reach to return to New York? The sales numbers need to be around $100,000 a year. As of [late 2011], they're still under $100,000. Have you set a time limit on living with your parents? My tenant in New York is on a six-month lease. So at six months I will assess where I am and how much longer I would have to live in this situation for it to work out. But I made the sacrifice, and if it takes eight months instead of six, then it takes eight months. It's worth it to me.